Howls Of Ebb is a duo of musicians that like to move into uncharted realms and get their hands dirty and muddy. They don’t just play death metal, they create the whole environment of a death metal fantasy world. It is the aesthetics of their music that helps the listener get sucked into, explore and experience a deviant world, filled with riffs, leads, solos, drum patterns that seem scattered but they are actually the pillars and a narrator that moves from whispers to growls, like a dark spirit that visits us in our nightmares. Cursus Impasse: The Pendlomic Vows should be viewed as a whole, a fully developed construction of apocryphal musings. It brings out a sense of rocking and fun. It is dark, it is twisted, it is muddy but it rocks. And that is not easy to achieve. Their identity, the thing that makes them who they are as musicians, is the different paths that the instruments take, creating a form of dissonance and diversity, while still working together to create a coherent song. The composition is a structure of sounds that move around an axis, while they take different forms. Ambient sounds, leads and the narration have a playful tone, like a Trickster that enjoys messing with our minds and make us a part of this concave, weird and abnormal world of theirs. The production creates a warm environment, like a cloud of heated vapor inside a humid cave. The drums sound like wooden ritualistic toms of ancient litanies, playing patterns that could accompany the high priest’s mumblings of mystical appearances in search for the dark morbid Zen. For example, Maat Mons’ Fume begins with ambience, drums and bass that set the environment. A guitar appears, playing a simple chord that works in the background for the duration of the first part of the song, creating an eerie atmosphere. The riffs and the mumbling of the voice work together, until the song builds up and the voice takes over. The guitars work with solos and leads around the voice and the central circular riff. They have a skill at composing unusual song structures that emanate an unnerving, dark and creepy atmosphere without being aggressive. Attractive, mysterious and weird, Cuscus Impasse: The Pendlomic Vows is an album for those who like to have fun in ancient mystical ruins and conjure the spirits of unknown worlds. Roteen' Blisssss and Zee-Luuuvft-Huund, the members of HoB, debuted with “Vigils Of The 3rd Eye” in 2014 and fully expressed their unique sound; an impressive album that gained attention. Last year they released an EP, “The Marrow Veil”, that ventured further into their fluid, unconstricted madness. With Cursus Impasse: The Pnedlomic Vows they appear to be more defined, if anyone can say this for HoB without having a smirk on their face, and they play music with one foot on the beyond and the other rooted in death metal. The cover art reflects the aesthetics of Hob’s music. 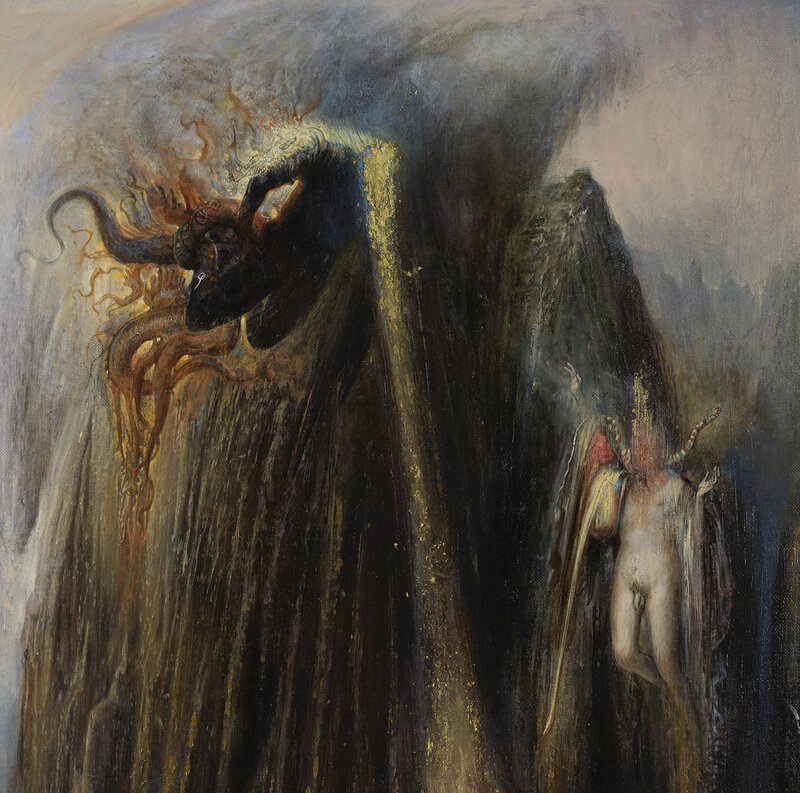 A painting called Theoin by Agostino Arrivabene. Go and admire his work HERE.